I recently received a Facebook message from one of my Japanese grandparents informing me that she and her husband were planning a trip to the UK, and as part of it, they were hoping to go to Wimbledon. In the same message thread she went on to say that she had given up trying to get tickets because it was too difficult. Getting tickets for any of the slams can be an overwhelming prospect. There are many websites claiming to sell tickets, and offering different plans, and if you’re not familiar with that country and context, it can be difficult to know who and what to trust. My suggestion would be to always start from the official tournament website and go from there. 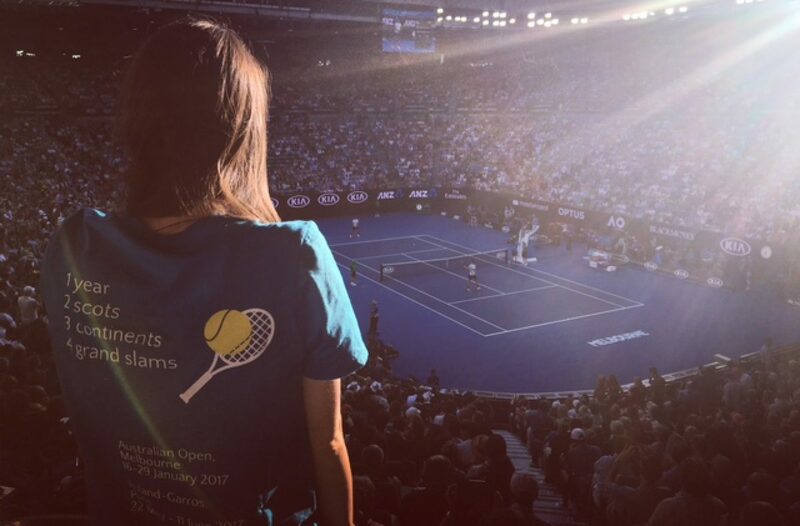 As I organise each of my grand slam trips, I’ll detail below how I went about getting the tickets, and how much they cost. Getting a ground pass for the Australian Open is a dream. You rock up whenever you like, queue for less than ten minutes, and away you go. The price varies according to how far the date is into the tournament. I went on the Tuesday of the second week and it was $45, but I know the price went down as the week went on as there’s less tennis to see. As for the finals, coming from Wimbledon territory, I had thought it would be a competitive process. I had seen on the tournament website that general ticket sales were opening to the public at 9am Australian time on Tuesday 11 October. Cue me rushing home from a musical in central London to ensure I was hovering over the ticket button at 11pm UK time. I kept clicking ‘Best Available’ and the seat Australia came up with for me was a seat with ‘Restricted Viewing’. I took the risk and as it turned out, I had nothing to worry about: I just had to ensure I had good posture for the evening! My ticket was $459 which works out as just over £280 and I bought it through Ticketek, following a link from the tournament website. I started chatting to a guy on the steps outside Rod Laver Arena and he told me he’d bought his final ticket that week. He explained that corporate sponsors return tickets they don’t need and they then go on sale to the public; when he realised there was potential for a Federer-Nadal final, he played the ‘refresh’ game on the website and was rewarded. It’s good to know you can buy tickets for the final the week of the event, though for me, I couldn’t have chanced my trip across the world on that possibility. My friend Mairi ended up buying ground passes for the final day and was treated to watching the mens final on big screens in Margaret Court Arena, the third biggest court at Melbourne Park. At the end of the match, Federer came into the court to see the crowd – bonus! Not being a tennis fan, Mairi was pretty chuffed with what she got for $20. One of many reasons why the Australian Open is the shizz. The French tournament has its own quirks with spectators having to buy all of their tickets – show-courts and ground passes – ahead of time. There’s no queuing at the last minute because the weather’s nice! For me, this wasn’t a problem as I had to plan my trip to Paris in advance and I decided to aim for the finals weekend again. The tournament website advertised that general ticket sales would begin at 10am, Paris time, on 22 March 2017. Cue me hovering nervously over my laptop again at 9am UK time, much like when I booked tickets for the Australian Open. I’d been told this tournament was the least popular of the four and so had been quite hopeful that I would get a ticket for the final. I had misinterpreted this to mean the tournament wasn’t popular. When I refreshed my page at 9am and it eventually loaded, I found myself 7139th in the queue. Maybe there are just a few people like me for whom this tournament is kinda a big deal. I was in the queue for about 40 minutes before I was able to book tickets. By this time, the final was sold out so instead I bought tickets for the two men’s semi-finals on the preceding Friday. These tickets were €70 per person per semi-final, meaning the total cost for me was €140 – a tad cheaper than my Australian Open final ticket! Was I gutted not to get a final ticket? Yes, for sure, especially as my dream is to see Andy win a grand slam in real life. However, from a quantity-of-tennis perspective, getting to see two semi-final matches, particularly with the “big four” all back in action this year, will be all-kinds-of-epic in itself. I hope so, anyway! (1) Create an account in advance so when you get through the queue, you can log straight in. (2) Check the website schedule in advance to know exactly which tickets and price categories you’re going to buy when you get through the queue. (3) If possible, join the queue on two different computers (or more if you have them!). When I refreshed at 9am, the page didn’t load and it took about 5 minutes for me to log my place in the queue. More computers heightens your chances of getting in the queue asap. Whilst RG is happy to wait until a couple of months before its spotlight to divvy out its tickets, Wimbledon makes you plan months in advance. Since 1924, Wimbledon has operated a ballot system for the show-courts, for every day of the tournament. Applicants can apply between September and December of the prior year but have no say as to which day they are/aren’t allocated. I’m not going to lie; it’s a bit of a faff. (2) You will then be sent an application form where you fill out some basic details. (3) You are informed if you have been successful the following February. Please note, this is the process for UK residents. The process of applying for show-court tickets if you are a non-UK resident is a little different. This year I entered the ballot for the first time. Someone at Wimbledon HQ must be looking out for me because last week (I am writing this on 26 March) I came home to find a very official-looking envelope waiting for me. As I opened it I had no idea who it was from until I saw the Wimbledon logo at the top and suddenly my unfolding became a lot more frantic. In short, I had been successful, and two tickets were waiting for me for centre court on Monday 10 July, the second Monday of the tournament, aka “Magic Monday”. That night I paid for the tickets online. The tickets will be delivered by post between May and June. Am I happy? Delighted! Wimbledon is the best-known tennis tournament in the world and tickets are highly sought after. My sister has entered the ballot five times and never been successful and here I was, getting tickets on my first attempt, for centre court, on one of the best days of the tournament (albeit, the seats are not together). I will explain why this day of the tournament is so great: during the first week of Wimbledon, the male and female players are split into two halves with each half playing on alternate days. However, on “Magic Monday’, the remaining men and women in the tournament all play on the same day, before the men and women then break up and play on alternate days. In terms of quantity and quality of tennis combined, there isn’t a better day in the tournament. Sure it’s no final, but let’s be honest, I’m only going to ever get a ticket for the Wimbledon final through some sort of miracle! You can queue on the day and buy these for £25 in the first week, and the price goes down as the tournament goes on. This enables you to access to the grounds and smaller courts for the entire day. In the earlier stages of the tournament, this means you can catch some great tennis matches as the wealth of talented players are spread around the courts. At 5pm, there is a ticket booth in the ground where returned show-court tickets are resold for £5/£10 bargain prices. This is actual gold and I recommend getting involved. Public ticket sales started on Monday 12 June, the day after Roland-Garros ended. I’d been so engrossed with the French that I was the least prepared I’ve been for any of the grand slam tournaments. Did I have to buy tickets right away? I was going to be on the Eurostar at the exact time that tickets were going on sale so that would be problematic. Thankfully, a last-minute shout-out on Facebook informed me that friends had only bought their tickets a few weeks before the tournament started, as they were renowned for going down in price. Now the US Open is very bizarre in terms of ticket sales. Seemingly they go on sale, people buy them and then immediately resell them on the tournament’s official resale site – this year this was Ticketmaster. This is what I kept an eye on for several months before deciding, a week before the tournament started, that we’d better claim our seats. And our seats were not cheap. However, we are going on the second day of the quarter-finals so understandably, the seats are more sought after than earlier stages of the tournament. One reason I’m not so keen on the US Open is the fact that they have day sessions and night sessions and you have to buy separate tickets for each session. Money making much? However, when in Rome. Anna and I will be going to the day session at Louis Armstrong – the last day of the tournament on this court – and I will go to Arthur Ashe by myself for the evening session. I am keen to compare and contrast the two biggest courts. Very excited!